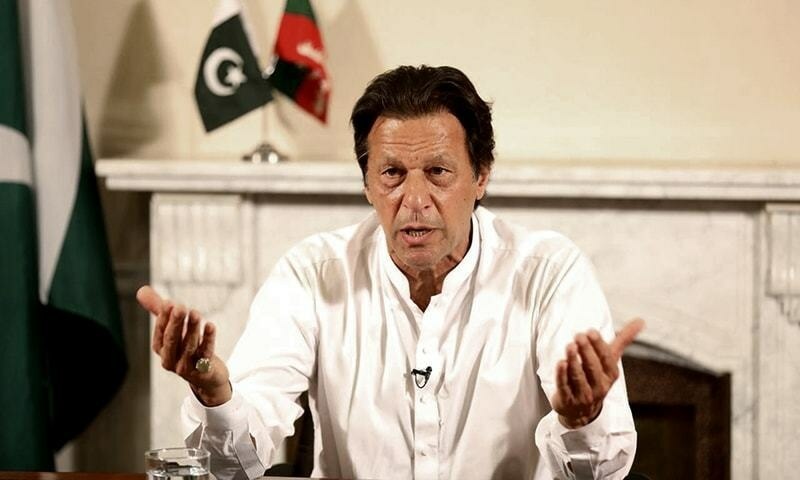 Does Imran Khan’s election campaign strategy mirror Donald Trump’s? Do you remember when Imran Khan spoke those words? If you have trouble remembering the precise moment, you are not alone. Khan used these phrases and ideas throughout the 2018 election campaign, ultimately leading his party – and himself – to power. But look again. This is not Khan at all. This is Donald Trump, November 7, 2016. Surprised? “Change” (or, more popularly, tabdeeli) has been PTI’s mantra for the past six years. Khan’s personal charm, along with slick and professional media campaigns, have kept this idea alive and well with the public. The media onslaught has been smart and sophisticated. 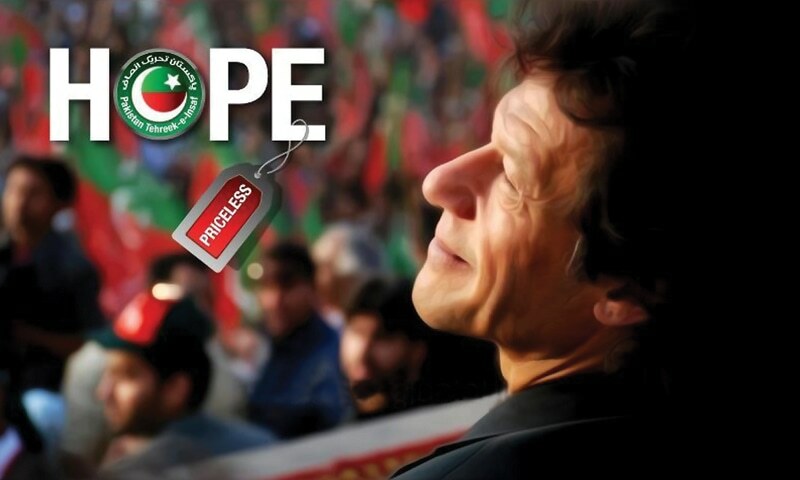 From ever-catchier jingles, to iconic graphic design work, to the ‘branding’ of each initiative taken by the party (for example, the wheel jam strike in 2014 had the tagline “Shutdown to rebuild”), to attractive election posters with stylised portraits, PTI’s marketing campaign has consistently been savvy and dynamic. The promise was and remains bold: PTI would wipe the slate clean of the corrupt ways of political administration and bring real change. The biggest USP of the PTI remains this: neither the party nor the leader have ever been in power on a national level. This and this alone, has helped paper over a lot of inconsistencies between the message and reality. Moreover, thanks to the impact of the election campaign, PTI fans still believe. Even those who did not necessarily align themselves with PTI politically are cautiously hopeful. Khan’s strong and consistent campaign has been relentless and on-brand without fail. The campaign has been run like a well-oiled machine with an obvious professional touch that has elevated it above those by other parties; the ideals of governance laid down are clear and unambiguous. Returning for a moment to Trump, his campaign strategy was focused on two catchphrases: “Make America Great Again” and “Draining the Swamp”. The first message was that US was not functioning to its peak potential due to policies adopted by Trump’s predecessors and the political administration was a ‘swamp’ riddled by a lack of transparency and corruption. It seems that the playbook has been adapted by the PTI. Over time, with the evolution of PTI’s politics, the message has shifted in tone slightly. The party focused on enlisting fresh, untested faces in the 2013 elections, reinforcing the brand identity. However, in the intervening five years, two key developments in the political climate took place. Firstly, PTI held a government in KP and its performance there came under scrutiny. Being part of the political machine for five years meant that PTI could no longer rely on its ‘fresh and untested’ status and had to answer for its governance. Secondly, as the party sensed a greater chance of forming the government on a national level, it adopted strategies that it once scoffed: enlisting tried and not necessarily true ‘electables’ from other parties, and banking on social infrastructure development in KP. To counter that, the party doubled down on the two messages: the persona of Khan himself and its governance record in KP. The narrative largely worked. With its rivals weakened due to a variety of internal and external factors, PTI strategised its campaign, focusing on a socio-economic agenda. The presence of Asad Umer in its ranks helped on that front. Now, the elections are over and PTI fans and neutral observers alike now eagerly wait for the promised ‘change’. The task at hand now is to convince the public that ‘good enough’ is not good enough. 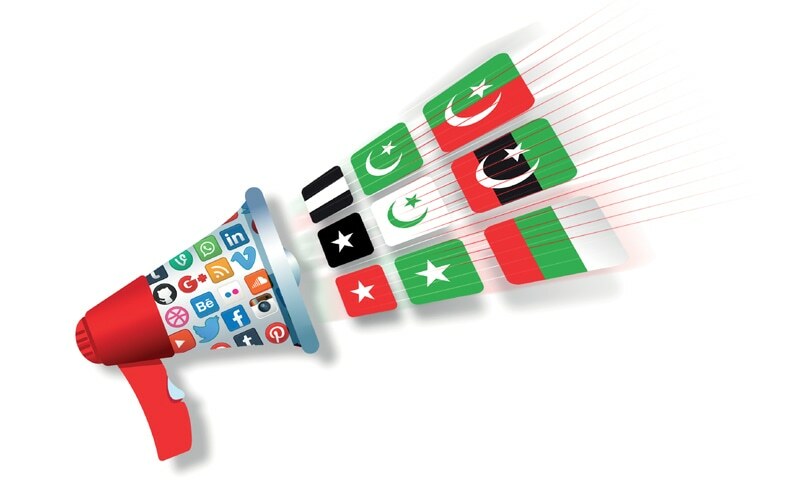 As the realities of governing a country materialise, the PTI’s media strategy remains focused on the future. The message is, "Wait and see, we can deliver.". While the strategy is working for now, it is high time that the ideals are put into practice, for the betterment of the party and for the betterment of the country. YES!!! only he lucked out - Pakistan is years behind in terms of having an involved educated electorate! In the US there is the FBI which has identified why trump was able to steal the election - Pakistan on the other hand used underhanded tricks to ensure no one else was able to compete against PTI - The country will undoubtedly pay - there is NO TABDEELI and NO NAYA PAKISTAN! It depends on who can tell MORE lies. No real change has taken place! At least Trump stuck to his promises! IK is deviating from his promises! Media illiberal tantrums in defence of the corruption status quo. Except Donald Trump is not a thief. Mark my words. IK will turn out nothing but alter image of our PM Mr. Modi. In due course he will blame all his failures on his precedents and do nothing. The ascent of Imran Khan is mainly due to on going fourth industrial revolution. Technologies are emerging and affecting our lives in ways that indicate we are at the beginning of a Fourth Industrial Revolution, a new era that builds and extends the impact of digitization in new and unanticipated ways. @syedchaudhrygangadinkhan : Except that there is honour among thieves. Trump has no honour to speak of. Microsoft CEO Satya Nadella has spent the past 25 years of his career working at the software giant. But he says he learned a critical lesson about leadership not during his time as an executive in the tech industry, but from his experience playing high school sports in India. As a junior at Hyderabad Public School, Nadella played cricket. I am confident that Imran having proved his ability to captain a disparate but talented team to a memorable world cup victory, will be eminently succeed in captaining Pakistan. https://www.khanmeter.com/ for all those who still think he is not accountable. This site will give you the status of all his "promises" so far. As for KPK, read the province's history, that province has never selected anyone who hasn't delivered. So the very fact he has won again from their shows the people of the province is happy with him. it's not even been a month and all kinds of "agendas" have started. Where were these people when Pakistan was in rule by PMLN and PPP. Why were they never made accountable? Their personality and background definitely have lots of similarities. But to be fair it is too early to draw any conclusions. Give the man atleast three months and then measure the direction of his performance. All politicians have high agendas,he's no exception. @Anita Choudhry I am sorry, this is not supposed to be a political analysis. In many ways what happened in the USA to get trump elected was more shameful. Typical pseudo-journalism drawing false comparisons between a xenophobic misogynist (Trump) and a patriotic philanthropist (IK). Good click-bait though...got me to comment too. Too early to make a call on PTI government's performance. I will them a year before criticizing. PML-N and PPP had a lot more long time (years and several terms) of honeymoon before the electorate realized there inefficiency and bungling and kicked them out. @Anita Choudhry. Whatever happened, he is the reality. Face it and let him move forward. It is not hidden that NS and Zardari also used underhand techniques to come into power. We all know it and let's not play angels. There is no comparrison. PPP is stuck in Sindh. PMLN in punjab. KP showed improvement. PTI showed that it will so anything to bring corrupt to justice. And people want change. They are tired or feudal lords and failed promises. Our people are also naive and follow where ever media take them. The Panama hangama, the Zardaris corruption and Thar, charisma of IK brought him to power. And media instead of focusing on what needs to be done is still trying to explain that he is the wrong choice. We have someone different, not from the main stream. And media and all are confused. The stupidity of this article is brilliant. One glaring example is the fact that IK has been struggling for the last 22 years and has been consistent in his message. Trump only came alive in 2015. For all his claims about possessing a "brain" and being able to "carry out an analysis", the writer can't even figure out who in reality copied who? Pseudo liberalism at its finest. In the USA it is the Republican Party, a well-entrenched business class and a strong military which is helping. In any case, America is one of the a super powers. Pakistan is not. Incorrect comparison. Pakistan has had a corruption from the lowest to the highest levels of government for as long as anyone can remember. Over half the population lives below the poverty line. Hospitals, schools, safe drinking water, natural disasters, you name it and corruption has a hand in ruining the basic day to day lives of people in Pakistan. Just because a crook in the white house used the same rhetoric to get elected in the US doesn't mean these are not fundamental issues that need to be addressed in Pakistan and should be part of our political discourse. There are other issues, of course that need to addressed and you can disagree with whether corruption should be the highest priority or not, but just because Trump said it too doesn't mean anyone who says it is like Trump. Trump is a hateful, bigoted person and IK has never spewed hate. Can you imagine Trump not demeaning Melania if she said the things Reham said of Imran? So please, enough of this ridiculous comparison. @Ashar Pervez Strongly agree with you.